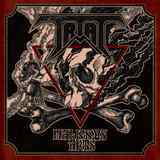 At the first glance it is hard to figure out why Malicious Arts EP by the Swedish newcomer Trial appears on Nuclear Winter Records, the label a lot more adept at releasing more extreme metal than the 80s NWOBHM tinged metal Trial play. Yet, the closer look of guitarists’ association with Ensnared (another band on Nuclear Winter roster) explains Trial’s home, at least for now. Apparently, Alexander Ellstrom and Andreas Johnsson had enough of old style classic heavy metal in them that death metal of Ensnared wasn’t enough of an outlet. Also, there is a clear link that unites Trial, Ensnared and Nuclear Winter – the propensity for occult. See, Trial isn’t your typical 80s rock-your-socks metal of Accept and Maiden, it aims for the dark arts, and achieves it. Both tracks of the EP have this authentic, slightly messy 80s sound, where guitars are engaged in true metal galloping riffs interlaced with speed picking runs, bass plucks along and drums are visible, adding on with their cymbal rides and splashes. In the middle of it all, front and center, and the main attraction of the band, rest the vocals of Linus Johansson. He can rip it in the lower register, but, when needed, can let out a King Diamond worthy falsetto scream. The evil sorcerer tower atmosphere is all over this EP, even though Trial did not have enough of stand-out melodies for my liking and is over-relying on Linus to provide the hooks with his voice. In that sense the intro to To Dust … and the more deliberate epic Of Sinister Seed pleased me more. The latter track picks up with urgency and is more memorable. On the pure sound aspect of their music Trial can well stand up next to Ritual, and combine the thrashiness of Helstar and occult creepiness of Merciful Fate and early King Diamond minus the synth. I understand that the dark arts, skulls and bones, is more focus for the band, but if the melodic epic quality found in Ironsword, Isen Torr and some other bands from Shadow Kingdom roster were to seep into Trial next works, the band would rise in my eyes quicker.